On November 15, 1935, the Commonwealth of the Philippines was inaugurated with Manuel L. Quezon as President, Sergio Osmeña as Vice President, and a unicameral National Assembly as the Legislature. One of the first acts of the President Manuel L. Quezon was to call for a special session of Congress to enact certain laws needed by the government. The law enacted was to create the Armed Forces of the Philippines by virtue of Commonwealth Act No. 1. The second was to create an advisory body for economic concerns of the Philippines. Commonwealth Act. No. 2, enacted on December 23, 1935, created the National Economic Council, which was tasked with advising the government on economic and financial matters, and formulate an economic program based on national independence. The president was authorized to appoint its respective members with the consent of the Commission on Appointments of the National Assembly. The year following its creation, the National Economic Council was organized on February 14, 1936, as President Quezon said in his Second State of the Nation address. The inaugural members were the Secretary of Finance (who served as Chairman), the Secretary of Agriculture and Commerce, the Chairman of the Board of Directors of the Philippine National Bank, the President of the National Development Company, the President of the Manila Railroad Company, Mr. Joaquin M. Elizalde, Hon. R.J. Fernandez, Mr. Wenceslao Trinidad, Mr. Vicente Madrigal, Hon. Francisco Varona, Mr. Ramon Soriano, Hon. Vicente Singson Encarnacion, Hon. Rafael R. Alunan and Hon. Manuel Roxas. The council was organized into eight committees: (1) Committee on agriculture and natural resources, (2) industry, (3) foreign trade and tariff, (4) domestic trade, (5) transportation and communication, (6) taxation, (7) labor and immigration, and (8) banking and finance. The first act of the council was to survey and adopt plans for an effective utilization and conservation of our natural resources. The council also undertook a study, in cooperation with the National Development Company and Metropolitan Water District, on the potential of water power resources which eventually led to the enactment of Commonwealth Act No. 120, creating the National Power Corporation. 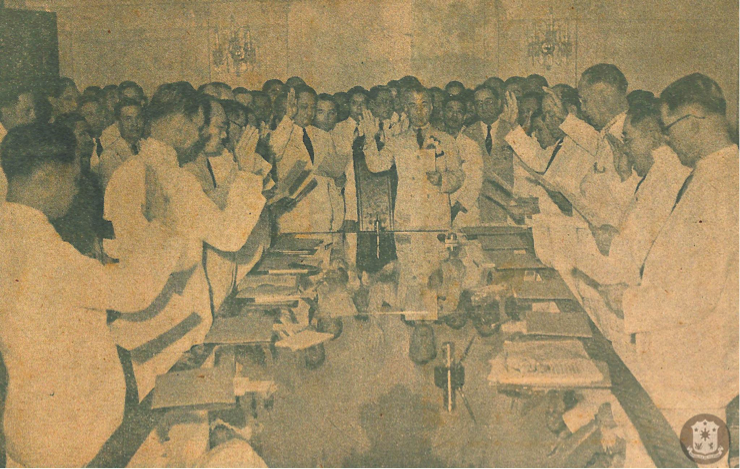 President Manuel L. Quezon administering the oath of office to the members of the National Economic Council in Malacañan Palace. Around the table, from the left are Jose Paez, Vicente Singson Encarnacion, Secretary Ramon Torres, Secretary Eulogio Rodriguez, Secretary Antonio de las Alas, Assemblyman Manuel Roxas (chairman), the President; Secretary Jose Yulo, Secretary M. Jesus Cuenco, Rafael Alunan, Miguel Unson, and Dean Bienvenido Gonzales. Photo from the Photogravure of Manuel L. Quezon. After World War II, the First Congress of the Philippines enacted , which allowed the President of the Philippines to reorganize the Executive Branch of Government as he sees fit within one year of its enactment. President Manuel Roxas, subsequently, amended the Administration Code of 1917 by issuing Executive Order No. 94, s. 1947. The Executive Order made the President of the Philippines the head of the National Economic Council. During his administration, President Carlos P. Garcia saw the need to create a new office in charge of the supervision of government corporations, which he called the National Development Authority. President Garcia asked Congress to enact such a law during his 1958 State of the Nation Address. When Congress finally passed the law creating the National Development Authority, President Garcia disagreed with its limited powers, thus vetoing the bill sent to him as he mentioned in his 1959 State of the Nation Address. In 1960, Congress passed a law, which changed the composition of the National Economic Council through Republic Act No. 2699 enacted on June 18, 1960. The law increased the Council’s membership by including the Secretary of Commerce and Industry and granting the minority party representation in the membership of the National Economic Council. The Council would continue to perform its functions throughout the Third Republic until the declaration of Martial Law on September 23, 1972. 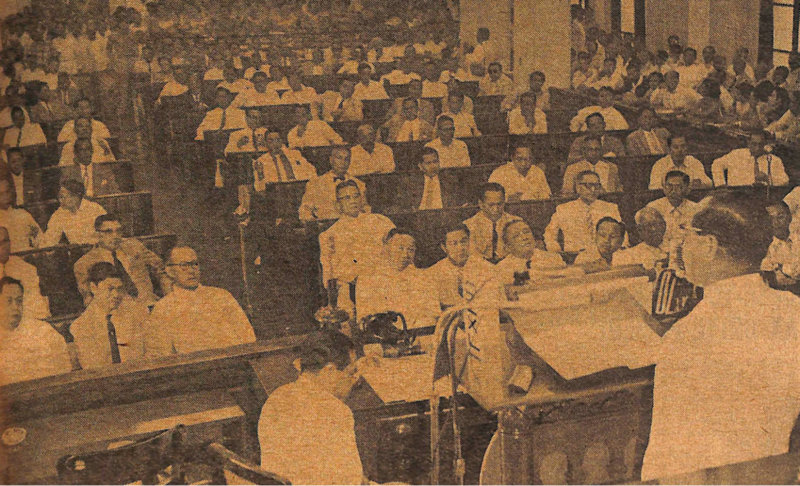 President Carlos P. Garcia’s Second State of the Nation Address delivered on January 26, 1959. Photo courtesy of The Manila Bulletin. The need for an office in charge of national development was revived during the administration of President Ferdinand E. Marcos. In his 1970 State of the Nation Address, Marcos said the administrative machinery of government must be restructured and revitalized to meet the challenge of change and development. Marcos, thereafter, crafted a government reorganization plan which included a National Economic Development Authority and submitted it to Congress for their approval. When Martial Law was declared on September 23, 1972, his first act was to implement, through Presidential Decree No. 1, s. 1972, the government reorganization plan he had submitted to Congress a year before. The decree merged the National Economic Council and the Presidential Economic staff, created by Executive Order No. 8, s. 1966, and renamed it to the National Economic Development Authority. President Marcos subsequently issued Presidential Decree No. 1-A which delineated the composition of the National Economic Development Authority. 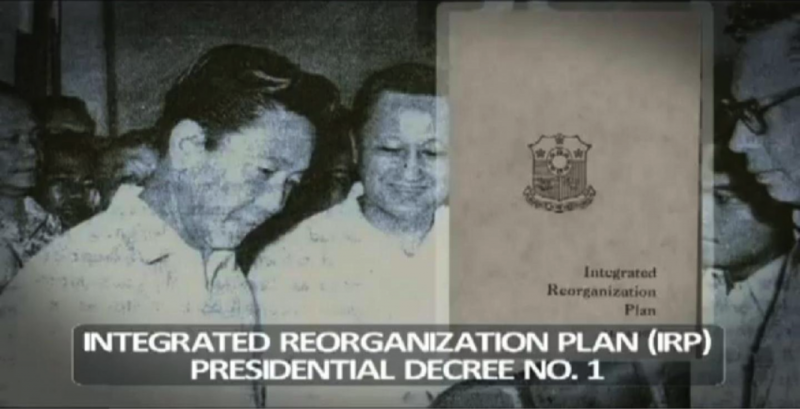 After he imposed Martial Law, President Marcos promulgated the reorganization of government as his first Presidential Decree. Photo courtesy of the NEDA website. In 1973, the National Economic Development Authority was dissolved by virtue of Presidential Decree No. 107, s. 1973. The Presidential Decree created the National Economic and Development Authority, which absorbed the National Economic Development Authority. When democracy was restored in 1986, President Corazon C. Aquino issued Executive Order No. 230, s. 1987, which reorganized and added offices to the National Economic and Development Authority which is retained by the present day National Economic and Development Authority. “History: The Department of National Defense,” Official Gazette of the Republic of the Philippines, November 17, 2014, http://www.officialgazette.gov.ph/history-the-department-of-national-defense/. Commonwealth Act No. 2 (December 23, 1935), http://www.officialgazette.gov.ph/1935/12/23/commonwealth-act-no-2/. “The First Annual Report of the President of the Philippines to the President of the United States Covering the Period of November 15, 1935 to December 31, 1936”, accessed on January 29, 2016, https://archive.org/stream/annualreport3536phil/annualreport3536phil_djvu.txt. “Statement: President Quezon on Appointment of Members of the National Economic Council, February 14, 1936,” Official Gazette of the Republic of the Philippines, February 14, 1936, http://www.officialgazette.gov.ph/1936/02/14/statement-president-quezon-on-appointment-of-members-of-the-national-economic-council-february-14-1936/.